Every good seedsman tests his stock for germination before offering it for sale. 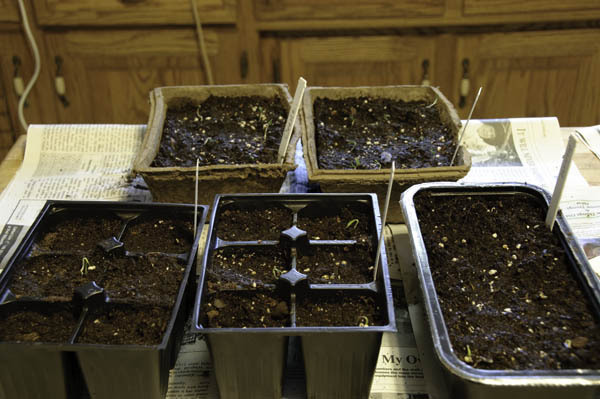 Most gardeners who save their own seeds or carry over purchased seed from previous years perform germination tests, too, well before planting time so there’s time to order replacements if the test batches fail to sprout. Lucky for me, Stuart at A Few Good Plants is a good seedsman and a good neighbor. Since he wasn’t ready to ramp up seedling production in his own greenhouse yet, he offered the test seeds to me. The test seeds arrived a few weeks ago in a plastic bag filled with other bags. 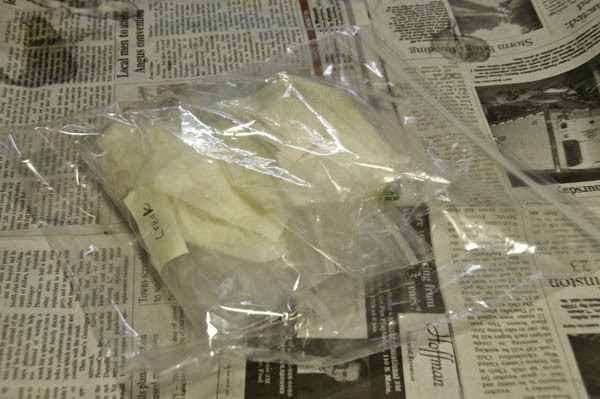 Each test batch was labeled by variety, and the seeds were happily sprouting inside on damp paper towels. I didn’t get to potting them up as quickly as I should have, and they continued to extend their roots for a couple of days. Some even had their first leaves by the time I had a few minutes free to gather pots and dirt. I broke off a few rootlets by accident while working them loose from their paper towels, but I managed to save more than enough, it seems. 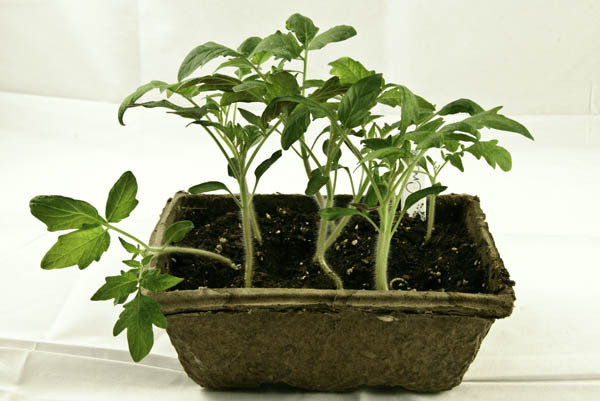 Above – the pots of seedlings, a day after I planted them. 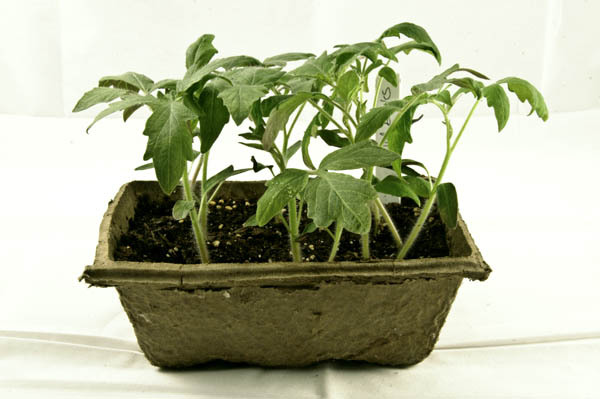 Above, Old Brooks tomato seedlings, which have been growing under lights on the plant shelf since the third weekend in February. The soft white fluorescent bulbs I used this year seemed to have the right color range of light for the seedlings. The leaves have a nice green, with only some minor signs of the purple tint that seedlings often develop under regular fluorescents. Of course, I could use the bulbs that are specially designed for plant lights. Those are optimal, but significantly more expensive. And so through the years I’ve experimented with combinations of lesser cost. My current light system consists of four shoplights hung above four shelves on a gorilla rack. The shelves stand in front of a window that receives morning light, so the plants benefit from natural daylight as well. The natural light wouldn’t be enough by itself for strong healthy seedling growth this early in the season yet — not at that window where the sun beams through strongly for just a few hours in the morning. 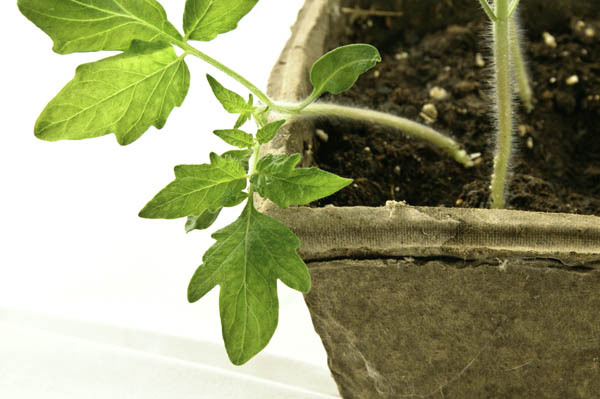 Lovely, healthy leaves on a Creole tomato seedling. 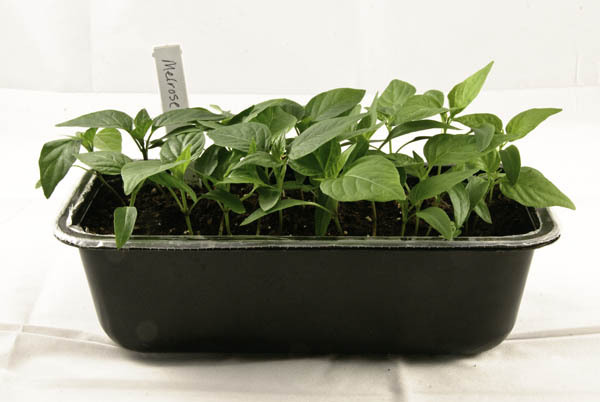 Melrose sweet pepper seedlings that need to be repotted very soon – if you’ve never tasted a Melrose, you’ve missed one of life’s great pleasures. 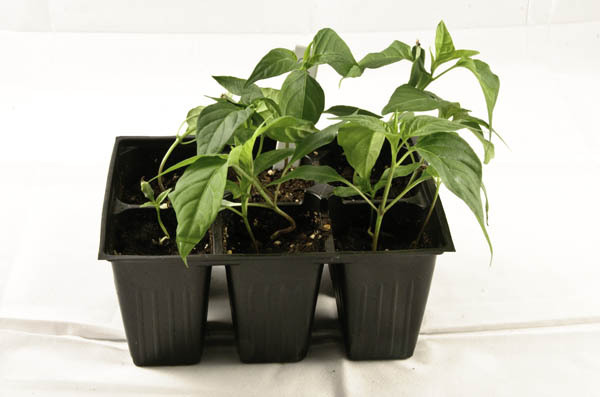 Chimayo chile pepper seedlings — a new variety to my garden. My mother used to dry her own chili peppers, and we used them all winter in homemade chili. I remember one year when the first pot of chili from that summer’s peppers was startlingly hot — so hot we had to add more and more tomatoes and beans and meats until we had a triple sized batch from a single measure of peppers. The summer had been particularly hot and dry that year, but we hadn’t accounted for that. Now we do.